I don't remember if I've told any of you that I'm a potter. The sad part is that I'm a potter without a studio. That's like being a painter without any paintbrushes. I have much of my equipment and could set up a studio, but I have no kiln. That's very important for a pottery studio, and they are rather pricey. 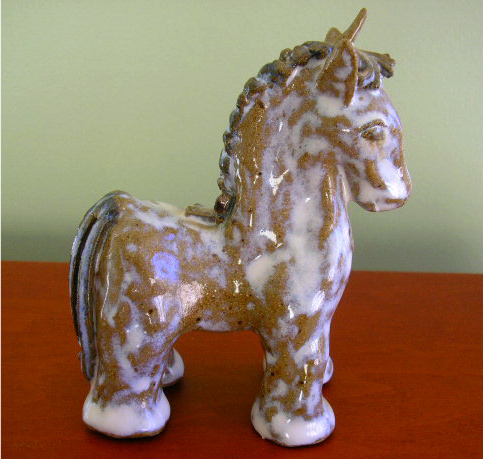 Many years ago, after high school, I took my first pottery class. It was called Stoneware Pottery I. I was in the class with about fifteen other people. After a tour of the studio, we were each seated at a pottery wheel. Think about Demi Moore in the movie Ghost. That's what a pottery wheel looks like. The smooth and artistic shapes she made at the wheel are what you're supposed to do with your hands. Folks- it's not that easy! Clay has a mind of its own and the ability to dance all over the place. 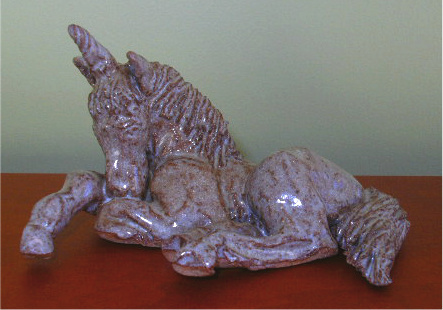 This is the unicorn after he had been glazed and fired. The instructor had a surprised look on her face as she said, "Why in the world would you ever want to throw pots when you can do that?" The remainder of the semester, I happily sculpted in clay. Many other creatures, and hand built trays were created. wasn't very good at glazing, but I think he has a comfortable, "funky" look. 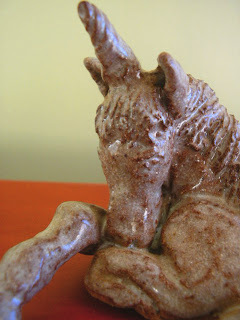 A few years ago, I returned to the same art center and took basic pottery. I was able to do the wheel much better, but it was nasty on my lower back, so I ended up back in my old routine. This time, there wasn't a unicorn in sight. I made lots of fun and functional thing and loved my "me time". After three semester, it became too impractical for me to travel a distance and spend a lot of money on a class. I decided to put that money towards my own equipment. Regretfully, other things took priority, but I hope to one day play in clay again. Today I'm linking to Katherine's Corner. Yes, I agree with the instructor. Why would you wanna do pots when you can do fine details like that!!! I'm amazed. I dream of having a studio too, but mine would be for painting pottery. I love doing that kind of stuff, wish I could do it without having to go to a shop and pay them to fire up my stuff in their kiln. Those are so cute! I would love to do pottery again. Thanks for stopping by! I love the unicorns and agree with the instructor - so much prettier than a "pot"
I hope you can return to your dream someday, you definitely have a gift!! I also love your Beautiful Unicorns !! I also hope you can follow your dream sweet lady. Your comments on my tablescape was so sweet thank you!! Hope you have a wonderful week with your family. Oh I hope you get to set up a studio one day! You are so talented! I still love my okra Santa! You have such talent. Don't give up on your dreams. Those are adorable! You really need to find the time to get back to sculpting one day, you definitely have a gift. Cute little guys- you are so talented! Patrice, I love your unicorn. Did you know it's the patron saint of the lost, wayward, homeless and foundlings? I think there's one flying over the farm; I can't see it but to the foundling animals that end up here, it's as plain as day. Oh my goodness, you definetely have a talent there! Have a lovely weekend! ... nice work by the way. You are very talented! I adore your unicorns! I can just picture you contemplating the clay and then, almost without thought, having your hands craft the creature. I do like the first tiny unicorne. You certainly have the talent! I hope you're able to play in the clay soon! I like your unicorns! I also love your blog header! Well, I like learning things about you I didn't know. I have a potter's wheel sitting right outside my bedroom window. I threw pots and I loved it. I haven't like you now because I need a kiln. I found out today that Em's already perfect friend, ran the Ceramic department at our college. Ron has wanted to get into it so he could throw his own bonsai pots. I totally understand about working with clay. Kessie is a sculptress. Except she uses Skulpy. Have you used that? The kind you bake in your oven. She taught that to her art students. I think your teacher was wise. My teacher said I was the worst untalented person he ever saw and I got kicked out. :) It was okay, I went to a class that taught needle arts. But still, I am always so slow and I would have done better in a room by myself. I will be praying about your day tomorrow. You are very talented. I would love to see more of your clay work.